Narcosis is aiming to bring very real world fears to life and Oculus Rift support is looking to help developer Honor Code with that in a huge way. Shacknews recently went hands-on with the survival horror game at last week's Game Developers Conference. Horror games have had something of a renaissance in recent years and it's one that's been bolstered by the growing trend of virtual reality. One of the latest games to incorporate the use of virtual reality is Narcosis, the first-person horror experience from developer Honor Code. During our time at last week's Game Developers Conference, Shacknews had the opportunity to grab an Oculus Rift VR headset and get a look at the game's latest build. For those unfamiliar with this exploration adventure, Narcosis puts players in the role of an industrial diver. After a dangerous accident, the diver is left stranded submerged in the ocean. The diver must use everything at his disposal to explore the underwater environment and make his daring escape before his oxygen (and sanity) give out on him. This may sound like a setup for some sort of supernatural adventure, however, creative lead Quentin De Beukelaer made sure to emphasize that there is nothing otherworldly about Narcosis. "I think a few years back, it was the zombie hype," De Beukalaer told Shacknews. "Every game was about zombies. And Benjamin [Perrot], our visual artist, was thinking of how we could make a game that was a survival horror experience, while getting rid of zombies, witches, spiteful spirits, and all that kind of stuff. To have a survival horror where the player is attacked by phobias, by the fears of a normal, individual human. We tried to base everything in reality." And given its setting, that does include the fear of drowning. Indeed, the natural dangers of the ocean are more than enough to startle anyone going in with the Oculus Rift. Much of my playthrough was spent digging through the rubble of an underwater space station. The absence of light and the natural rustling of sounds in the distance was enough to create a suspenseful atmosphere, but the horror amplified that much more when a squid jumped out and latched onto my face. I frantically boosted to force the creature off before cautiously backing away into the nearest open chamber. 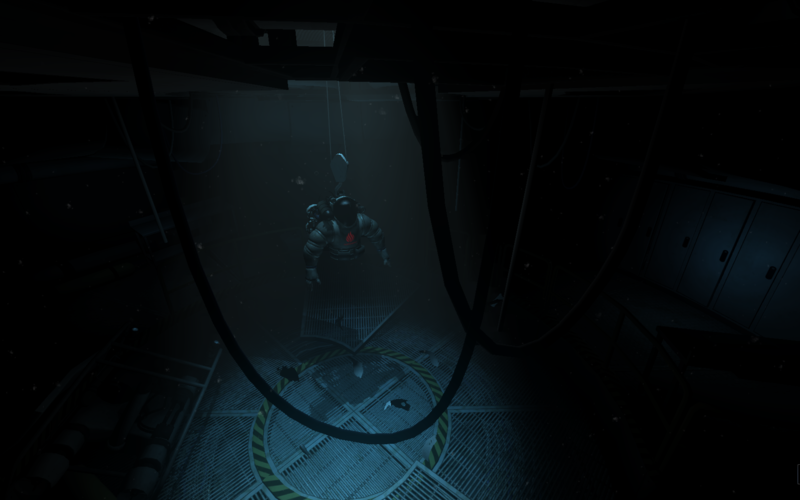 These scares linger throughout Narcosis and while they can create a tense environment as a first-person experience, they're far more frightening when played in virtual reality. A part of that immersion is also due to the Narcosis' minimalist presentation. De Beukalaer added that HUD elements were intentionally removed to create a greater sense of reality. The only indicators of danger will come from the diving suit, which will include its own diagnostics system. However, this element appears to be intentionally minimal. Honor Code wants an immersive experience, one that will bring very real world fears to life. "Without spoiling too much, for sure there is drowning," De Beukalaer answered. "You might have noticed some cracks at your helmet, so you'll be playing and at some point, if you get one more hit, your helmet will break and water will seep inside. And there's also asphyxiation, where if you run out of oxygen, you will enter an hypoxia state. It's a state where people don't have enough oxygen. We try to create a visual representation of hypoxia. And for sure, there's the fear of darkness. There are points where you get comfortable with a flashlight, but in some portions of the game, you won't have these tools and darkness will become far more present." Narcosis is aiming for a PC release later this year. Look for Oculus Rift support to ideally be in tow.